Mikhail Borisovich Khodorkovsky, formerly the wealthiest man in Russia, was arrested at gunpoint on a snowy Siberian runway on October 25, 2003. After challenging the absolute power of Vladimir Putin in the name of an open society, his oil company, YUKOS, was seized, followed by a trial that caused international outrage. He remains defiantly imprisoned following a recent conviction on embezzlement and money laundering charges in a second trial alleging that he stole a larger sum from YUKOS than its annual gross receipts. Khodorkovsky’s life, the way in which he rose to prominence and the dramatic circumstances of his fall, are a chilling metaphor for the violent political and socioeconomic changes occurring in Russia in the last two decades. VLAST (POWER) shows how liberty and the rule of law have become casualties of the new Russia in a compelling scenario of political intrigue in an oil dependent economy. Exemplifying the wide net cast to bring down Khodorkovsky’s empire, VLAST (POWER) tells the stories of the persecution of several key members of his inner circle. It highlights the unchecked idealism characterizing a small group of the earliest generation of “new Russians.” Young people who came of age with the fall of the Berlin Wall, inspired by prospects of democracy and an open society, these best and brightest were handpicked as lieutenants by Khodorkovsky. The film portrays the promising universe Khodorkovsky created and the destruction, devastation and disillusionment his prosecution and conviction brought to the lives of those around him. In spite of the harassment to which they and their families were and are subjected in the wake of their boss’s prosecution, they remain committed to seeking justice for themselves and for Khodorkovsky through the proper application of law. In her directorial debut, Cathryn Collins gained unprecedented access to Khodorkovsky’s family, his closest associates, and the highest level of politicians and journalists in Russia. The interviews conducted by Collins over several years and at great personal risk, deliver a frightening account of repression and retribution reminiscent of Stalin’s Russia. VLAST (POWER) is an unvarnished picture of political upheaval, consolidation of power, and the erosion of democracy in modern Russia. The film was funded independently by Cathryn Collins and Executive Producer Pilar Crespi. 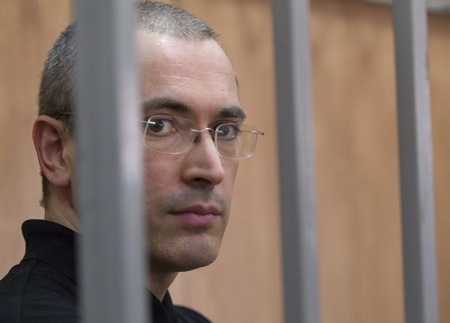 For more information on Khodorkovsky and the YUKOS case, please visit our NEWS page.